All our workers are with top skill in inflatable field, all of our stitching inflatables are stitched by high precision stitching machine, we always apply double stitching anywhere in the inflatables and quadruple stitching in positions sustaining much force and pressure from jumping. 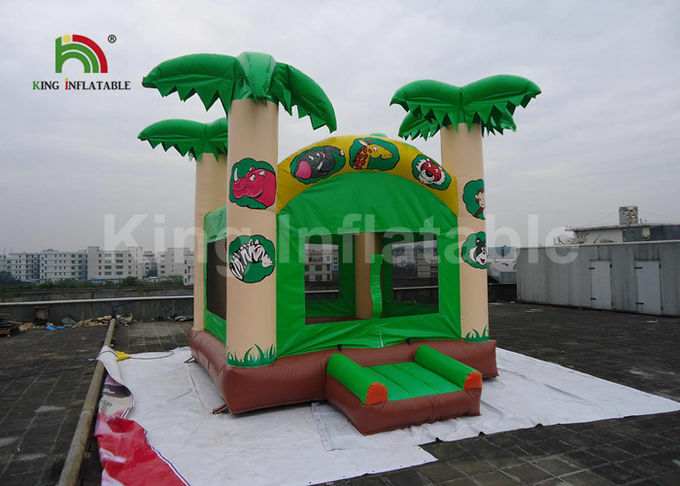 All of our airtight inflatables are made with high temperature multifunctional welding machine, which is necessary and efficient for massive airtight inflatables. 1, Turn on the blower to inflate, turn it off to deflate, deflate zipper will make it faster. 2, design for 3-10years old kids, Adult Supervision of children in a bounce house is required at all times. 3, Many D rings around the bottom and top as anchors with rope to tie a weigh, in case of strong wind. 4, The obstacles designed as animals, It will be more atractive for kids to biff and bash. 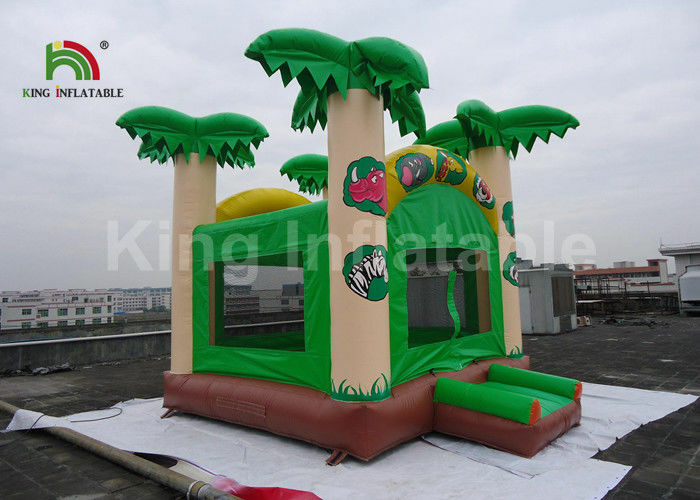 5, 16feet Inflatable Jumping Castle Animal Bouncer With Obstacles For Biff N Bash for birthday gift or Rent / Hire business. 1. Place the equipment on a flat surface, preferably under a piece of equipment (such as carpet, plastic color of the cloth), and then expand it. 2. Find the air inlet of the equipment, connect with the air outlet of the bloweror air pump, and fasten it, then tighten the air inlet with a rope. 3. Turn on the blower and the item will blow up in 5-10 minutes. 1. Cut off the power, open the interface and exhaust, exhausting in generally 10-25 minutes, the remaining gas to squeeze. If the equipment was wet by rain water, please be sure to drain water out and dry. 2. Do some cleaning. You can use the detergent to wash it, and wipe with water, and then dry in the sun. 3. Fold the device, and cover it with a tarp. 4. If long time no use it, you should keep it clean and packaged. Storage temperature is generally -50 ~ +40 degrees Celsius is appropriate. 5 Blower or air pump should prevent from moisture and corrosion. Inflatable items should keep away from insect.